I'm so sad to hear that Roy E. Disney passed away earlier today. I wasn't aware that he'd been battling cancer, so it was quite a shock to me. There are a lot of memories that are flooding back from the last 25 years - starting in 1984, when there was that attempted takeover of Disney, which coincidentally reared its ugly head only several months after I'd first started my Disney career in the Canadian office. I recall that Disney staff far and wide were all pretty nervous of how that would end, but once the attempt was thwarted and the dust had settled, Disney had a new management team in Michael Eisner and Frank Wells, with Roy having been instrumental in negotiating their installation at the helm. Admittedly, I wasn't that thrilled with the direction they soon started taking Disney in, but I was happy that Roy's part in the deal was that he would be the, albeit, figurehead in charge of Disney Feature Animation, as we saw him as the protector of that most important, yet under-appreciated division of the studio. It seemed that, were it not for Roy Disney, Disney Animation might have been dissolved soon after Eisner and Wells took charge. Fortunately, Roy convinced them of how important it was and that eventually led to such films as The Little Mermaid, Beauty and the Beast and The Lion King, putting Disney once again at the forefront of animated entertainment. After Frank Wells was tragically killed in a helicopter crash in 1994, Michael Eisner started getting too big for his britches, making a lot of ill conceived decisions that were judged by many to be detrimental to Disney. Eventually Roy became so fed up with it all that he quit the board of directors (or was in danger of being squeezed out ) and started the "Save Disney" campaign to oust the tyrannical Eisner from his position as CEO. His efforts ultimately proved successful, leading to a humiliating revolt against Eisner at the 2004 shareholders' meeting, forcing his hand to leave the Company during the following year before his contract officially was up. Back around 1981 or 1982, before all that mess with the Disney takeover attempt, I have one very fond, personal memory of Roy that I think says a lot about the man's character. Here in Canada on CBC (our public network) there's a long running current affairs show called The Fifth Estate, similar in format to CBS's 60 Minutes. Back at that time, they did a show where they investigated the mistreatment of animals that was purported to be rife within the TV and movie industry. It ran at least a couple times in repeats, so I remember it well. One of the guys they interviewed on the subject was Marlin Perkins, former host of TV's Wild Kingdom. When confronted with information from people who'd worked with him on some of his nature shows claiming there were contrived setups with animals that put them at risk of injury and death, Perkins denied it all, eventually losing his cool and demanding that they turn off the camera and stop the interview. Perkins came off as a bald-faced liar as a result. Afterwards, there was a similar confrontational grilling of Roy Disney in what looked like his living room at home. The journalist confronted Roy with the accusation that there had been deaths of animals during the making of some of the True Life Adventures of the 1950s, in which Roy had been in charge of one of the camera units filming animals supposedly going about their business in the wild. I recall the journalist aggressively accusing the filmmakers of stampeding a horde of lemmings over a rocky cliff in White Wilderness. And while lemmings are believed to commit mass suicide in such a fashion, apparently these weren't the right sort of lemmings who are purported to do that! While the self-righteous journalist was accusing him of these misdeeds, Roy just sat there in his armchair very calmly smoking his cigarette before finally being given a chance to respond to the accusations. Instead of denying it all like Marlin Perkins had done, Roy just casually replied (and I paraphrase) "Yeah, that probably was what happened. We wouldn't do that type of thing today, but back then we did what had to be done to get some exciting footage in the wild". No vehement denials - just a somewhat sheepish grin, perhaps denoting some small pangs of latent guilt. 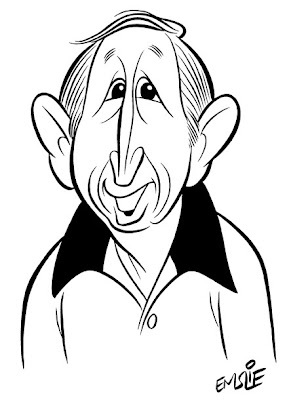 Anyway, it took the wind out of the sails of that indignant interviewer and I admired Roy Disney for his refreshing frankness then and ever since, as every time I'd seen him on camera I was struck by how genuine and devoid of Hollywood b.s. this mild-mannered man was. If you'd like to see Roy at his finest, I'd highly recommend checking out his lengthy interview with Leonard Maltin on the On the Front Lines DVD set, devoted to Disney's wartime cartoons. Roy fondly shares his firsthand memories of visiting his dad's and uncle's studio as a boy during World War II. His incredible knowledge of that period and nostalgic anecdotes are just a joy to watch. You can see just how much Roy loved and respected his uncle Walt's legacy, which explains why he felt so compelled in later life to defend Disney animated filmmaking at all costs. I'll always love ol' Roy for that, and I'll miss the man very much. Yes, it's that time of the year again, when The Cartoon Cave pays tribute to the greatest of them all, Frank Sinatra. I've written about Frank often on this blog, but he will always be celebrated here, as he typifies the entertainment from that glorious past that I love so much. In honour of his birthday, I sketched a new caricature of him, this time trying something a little different in the rendering technique. Instead of my usual brush and ink with Photoshop colour, I decided to draw him on toned paper with coloured pencils just to see how it would look. It may be a bit overdone in some areas, but I'm relatively happy with the result. I actually got the inspiration from having seen a similar approach by several of my very talented Sheridan animation students while reviewing their sketchbooks this past week. The reference I used for this one was a scene from Tony Rome, in which Frank played the title character, a rough and tumble private detective operating in modern day Miami, Florida. The film also starred the delectable Jill St. John. Though I unfortunately can't embed the YouTube clip for this one, here is a link to the opening clip of Tony Rome, featuring the title song sung by Frank's little gal, Nancy Sinatra. Enjoy! Yes, I know it's been a long time since my last blog post. I just haven't had much in the way of new stuff to put up lately. However, I did have a rather exciting thing happen last Friday evening that I want to post about at this time. 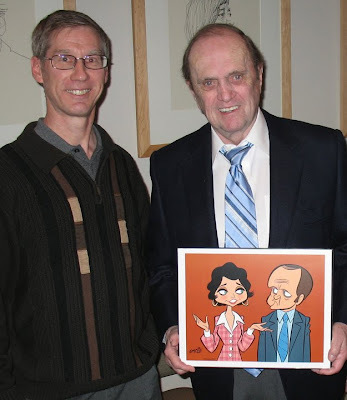 I finally got to meet one of my top favourite TV stars of all time: Bob Newhart! I've written of Bob several times on my blog, including this tribute. Bob was here in Toronto last Friday appearing at Roy Thomson Hall. I only found out about his scheduled appearance last Monday, so I was fortunate to be able to get good seats on such short notice. I'd actually seen him in concert about 20 years ago, also at Roy Thomson Hall, and I'd been kicking myself ever since for not trying to meet him back then. This time I was determined to do it right. I ended up sending off a quick note to him, care of the venue, including a small image of my caricature of him. Thankfully, the folks at RTH passed it along to him and the result was my name ended up on the list of those who would be granted a backstage visit with him after the show. It was an admittedly short meet and greet affair, where there were several small groups waiting to say "Hi Bob! ", so there wasn't any time to really chat with him. But, still, it was enough for me to just finally get to meet one of my TV heroes in person and present him with a framed print of my caricature. Bob got a big kick out it and was gracious enough to pose for a photo with me and autograph an additional print for my growing collection. The performance itself was very good, though it seemed a bit short at just over an hour of Bob himself, after a short warmup act by a songstress singing Vegas style standards (I feel bad for not catching her name!). He included one of his famous telephone routines (on a cell phone yet! ), the one involving Sir Walter Raleigh reporting back to his superiors in England after being introduced to the concept of smoking cigarettes by the Native Americans. A good review of his show on Friday can be found here. He's really quite amazing and I'm just happy to see this comedy legend still touring and performing having recently hit the age of 80. Here's to you, Bob!